MdR, did you try by removing atioglxx.dll? Yes, I did it just after installation because game wasn't working at all IIRC. Maybe you should update to version 0.973. It is recommended to reinstall the version 0.972, then unzip the .zip file for version 0.973 in the SpaceEngine folder. even with a 1000 or 2000 ly search. it used to run perfectly and then when i opened it again it started to run slowly. i rinstall it again, but nothing happened. Unfortunately you gave us no useful infos. Can you attach your se.log please? Did you checked the overall condition of your pc? Do you have a working antivirus? What OS? Did you changed graphic drivers perhaps? I downloaded and installed space engine, but when i open it, it says i use (open GL 2.1) and that i need to upgrade my graphics card driver or install compatible hardware, i tryed both, but nothing worked, i found a way to disable it, but then when the program opens and when i press to start, it just auto closes and it wont open anything, my computer is kinda old, but im really sure that this computer can run it even with some lag, i tryed even the old version and i still get the same errors.. i'm sorry that i made you lose time reading this, but if there is anyway anyone that could help me, please do? there is a file named se.log in your Space Engine folder, under a subfolder named system. Could you please attach that file in a post? I'm afraid your computer simply can't manage to run SE, but that file contains more precise informations. Whoa ._. First, you're using a version of SE that's very old. But the reason it doesn't work is that your graphics card is extremely obsolete. 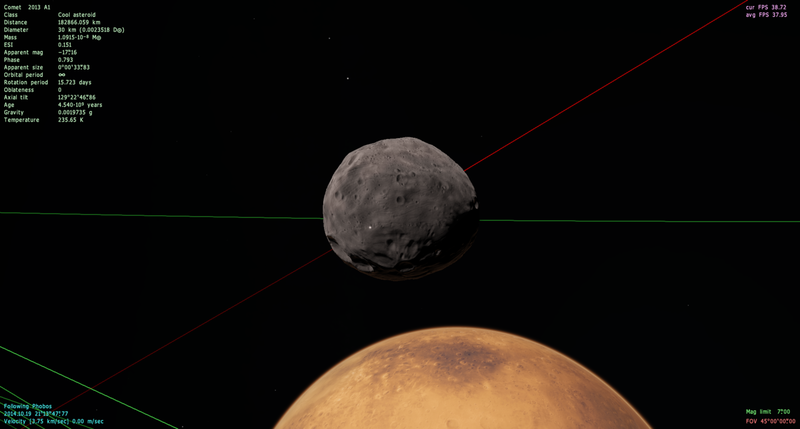 SpaceEngine requires a graphics card capable of running OpenGL 3.3 or higher. Your card is 9 years old and extremely weak, and only supports OpenGL 2.1. It is impossible to run SpaceEngine on it. Sorry. The only way you will be able to use SpaceEngine is if you upgrade your computer with a new graphics card. If your computer cannot be upgraded, you will have to buy a new one. I'm getting these glitches on just about every planet I go to, when I'm close to the surface for a short time the planet glitches out and these very annoying squares show up, I've tried the recommendations but no luck, (clearing cache and a fresh install). I've also tried texture compression, nope. I'm using 0.9.7.4. The 'user.cfg' is in the folder '[SpaceEngine]\config'. Androverse, screenshots? Log? Something helpful please?